Grandma always told you to eat your carrots because they’re good for your eyes, but is it just an old wives’ tale? Can what you eat really make a difference for eye health? “The short and sweet answer,” says Allen Ho, M.D., “is yes, what you eat makes a difference.” Dr. Ho is a retina surgeon and the director of the clinical retina research unit at Wills Eye Hospital and a professor of ophthalmology at Thomas Jefferson University, both in Philadelphia. According to him, the foundations of eating for eye health are simple: Eat a variety of colors every day. So, Dr. Ho tells his patients to eat a diverse diet rich in nutrients, minerals, and micronutrients. The especially good news is that the foods that are good for eye health also tend to be good for you in general. They’re high in fiber, antioxidants, and healthy fats that your body needs, so make sure to share this lineup with your patients—and add these to your own shopping basket. 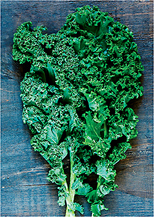 LEAFY GREENS : Besides being high in fiber, folic acid, and iron, dark leafy greens—from today’s ubiquitous spinach, lettuce, and kale to the more rare collards, mustard greens, or Swiss chard—are great for your eyes. They’re high in antioxidants, specifically carotenoids lutein and zeaxanthin, both of which are stored in the macula and, like sunblock, serve to protect the retina from damaging light. Depending on where you live, greens like these are available locally year-round except for the coldest weeks in winter and the hottest ones of summer. 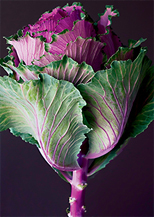 Don’t be afraid to try new-to-you power greens varieties like tatsoi, mizuna, dandelion, broccoli rabe, or turnip greens. ORANGE VEGETABLES & EGG YOLKS : The bright orange hue of carrots, orange bell peppers, and sweet potatoes is a dead giveaway that you’re looking at an eye-healthy vegetable. 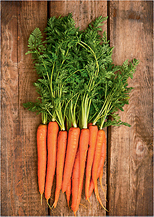 Beta-carotene, which gives these foods their orange hue, is a carotenoid that the body breaks down into vitamin A. Eaten in combination with sources of zinc, vitamin E, vitamin C, and the micronutrient copper, beta-carotene has been shown to slow the progress of age-related macular degeneration (AMD). In the U.S., most chickens are fed supplements of beta-carotene to give their flesh and their egg yolks a more golden hue, and though it’s done for mostly aesthetic reasons, it does mean that eating eggs offers a sort of complete package: healthy fat and protein, plus zinc to help ferry vitamin A to the retina in order to produce melanin, pigment that protects the eyes from sun damage. 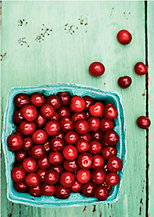 BLACK CURRANTS, CHERRIES, DARK BERRIES : Dark fruits are superfoods for so many reasons, but for eyes they’re especially good. Anthocyanins, the flavonoids responsible for giving these fruits their deep purple, blue, and red colors, have been shown to protect the retina from oxidative stress, and they may also inhibit lens opacity and reduce diabetic cataracts. The vitamin C in these fruits is also a powerful antioxidant. Though black currants are difficult to find fresh except at rare farmers’ markets, they’re widely available both dried and freeze-dried at specialty grocers and health food stores. Look for a version without added sugar and add these to granola, smoothies, or baked goods. When organic, chemical-free blackberries and cherries arrive to markets in summertime? Treat yourself. 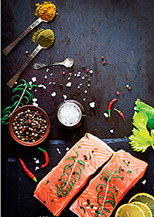 WILD-CAUGHT FISH : Fish such as tuna, salmon, mackerel, sardines, and anchovies are high in beneficial omega-3 fatty acids, one of which is DHA, docosahexaenoic acid. DHA is a major building block of the retina, as well as the brain, skin, and cerebral cortex. In fact, fully half of the body’s photoreceptors, rods and cones, are made up of omega-3 fatty acids. So, it’s hardly surprising that diets rich in this element can help stave off AMD. In the form of whole foods (not supplements) omega-3 fatty acids have also been shown to help with dry-eye syndrome. While fish like salmon, tuna, and mackerel are readily available year-round, an even better choice is smaller fish such as sardines and anchovies. Eating these frequently doesn’t pose the same risk of mercury contamination as eating larger fish does, and it’s better for our oceans, too. Vegetarian? Seek out sources of omega-3s derived from algae instead. 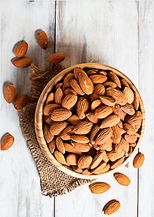 ALMONDS, SEEDS, WHEAT GERM, PISTACHIOS : Though calorie-dense, these foods are all exceptionally high in vitamin E, an antioxidant that has been shown to reduce the progression of AMD and the formation of cataracts. Additionally, the mono- and polyunsaturated fats in pistachios and other nuts help boost the absorption of carotenoids found in vegetables, which makes for a nutritional one-two punch that’s great for the eyes.